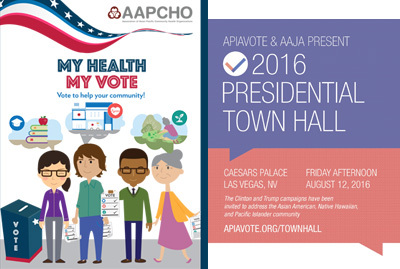 On Friday, August 12, Asian American elected officials will join health center leaders from across the country at the Association of Asian Pacific Community Health Organizations (AAPCHO) My Health, My Vote press conference, preceding the Presidential Election Forum in Las Vegas. Members of Congress will deliver remarks on the importance of voter outreach and education for Asian American, Native Hawaiian, and Pacific Islander (AA&NHPI) communities, and the critical role health centers play in reaching this diverse and rapidly growing population. Health center leaders will also speak on the work they have been doing on the ground to register thousands of eligible AA&NHPI voters as part of AAPCHO’s My Health, My Vote campaign—a nationwide, nonpartisan and multilingual voter registration campaign aimed at mobilizing AA&NHPIs and other underserved populations served at health centers. Health center leaders and frontline staff will be available to share patient and community member stories. My Health, My Vote press conference with Asian American elected officials and health center leaders, followed by brief reception with light refreshments. This event is open to the public and light refreshments will be provided. Interview and photo opportunities will be available. Media wishing to attend should RSVP to bquintana@aapcho.org to receive additional details.